The Chokurdakh Scientific TundraA type of ecosystem in which tree growth is limited by low temperatures. The origin of the word is from from the Kildin Sami word tūndâr, meaning "uplands" or "treeless mountain tract". In the northern... More Station is owned by the Institute for Biological Problems of the Cryolithozone (Siberian Branch of the Russian Academy of Sciences). The Chokurdakh Scientific Tundra Station (70°49’28’’ N, 147°29’23’’ E; elevation 11 m a.s.l.) is situated in the Kytalyk Wildlife Reserve, located on the north bank of the Elon’ (Berelekh) River in Northeastern Yakutia, Republic of Sakha (Yakutia), Russian Federation, approximately 25 km north of the Chokurdakh settlement and around 480 km north of Arctic CircleA line of latitude currently at 66° 33′ 44″ (66.5622°) north of the Equator. It is the southern limit of the region of the Earth that experiences the 'midnight sun'.... More. The research area consists of three different morphological units, i.e. (i) the present, frequently flooded river floodplain, (ii) the river terrace with tundra vegetation, and (iii) higher (10-30 m) plateaus with well-drained soils. The ice-rich continuous permafrostPermafrost is frozen ground that remains at or below zero degrees Celsius (32 degrees Fahrenheit) for two or more years. It forms in regions where the mean annual temperature is... More reaches more than 300 m depths. The levees on the floodplains are overgrown with Salix brush. The backswamps consist of meadows with low grass (Arctophila fulva) and sedges (Carexarctisiberica, C. glacialis) grading into shallow lakes. In the tundra, the main vegetation types are dry heathA type of shrubland habitat mainly consisting of low growing, woody plants (shrubs). Heaths occur on acidic soils and in dry conditions and are common in the Arctic and sub-arctic.... More with Betula nana on higher sites (polygon rims, palsas); moist tundra with Eriophorum tussocks; wet sites with Sphagnum and Carex sp., and wet sites with a species-poor vegetation of Carex and some Eriophorum. At several sites the Sphagnum vegetation overlies a very thin active layerThe layer of ground above permafrost that is subject to annual thawing and freezing.... More of loose moss peatPeat is a soil type formed from slowly decomposing vegetation. It is found in wet areas where the lack of oxygen slows the breakdown of plant matter. Peatlands are areas... More (<20 cm thickness). 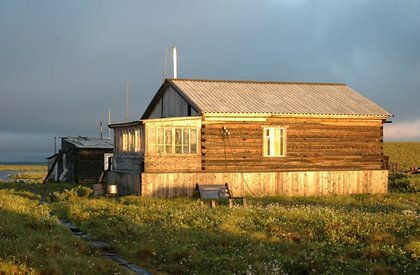 The station was established in 2001 by the Siberian Branch of the Russian Academy of Sciences and the Vrije University of Amsterdam (Netherlands) with financial support from the government of Netherlands and with permission and help of the Ministry for Nature Protection of the Republic of Sakha (Yakutia). For accommodation, there is one 4×8 m large living house with four beds and firewood and kerosene heating. Additional tent accommodation for 4-6 peoples is possible during summer time. Kitchen is available. In addition, a big house for 10-12 peoples and a sauna can be rented from the Kytalyk Wildlife Reserve. There are two 5 m high observational towers for meteorological and flux measurements. Basic instruments are available at the station. Electrical power supply is provided by solar power and wind generator (12 V DC) and portable electrical generators (220 V ACArctic Council, a high level forum of Arctic nations (Canada, Finland, Denmark/Greenland, Iceland, Norway, Russia, Sweden and the United States). Also includes indigenous peoples representatives.Arctic Council, a high level forum... More). The interdisciplinary research at the Chokurdakh Scientific Tundra station mainly focus on studies of the environmental conditions and the role of permafrost ecosystems in Climate ChangeAccording to the United Nations Framework Convention on Climate Change, climate change is change in the climate of the whole Earth or a region of the Earth that is believed... More. This includes the interaction between the atmosphere, the biosphere, the hydrosphere, and the cryolithosphere with respect to biodiversity and global environmental change. Short-term monitoring data exists for different aspects of human activity. Data is available at the web-sites of PIN-MATRA and TCOS-Siberia projects. The Chokurdakh Scientific Station is situated in the Kytalyk Wildlife Reserve of the World Wide Fund for Nature, which is dedicated to the preservation of the white crane (Grus leucogeranus). Human activity is restricted to fishing and reindeer herding. The Chokurdakh Scientific Tundra Station can be reached from Chokurdakh settlement which is 3.5 hours by airplane from Yakutsk. From June to September, the transport to the station is possible by boat (2 hours from Chokurdakh along Berelekh River). In winter-time (November-April), transport takes place by snowmobile/sledge (2 hours from Chokurdakh).